Did you know you have better odds at winning the lottery than an Olympic medal? To bring home one of those coveted medals—or achieve any great personal goal in life—you need a lot more than luck. You need a game plan. 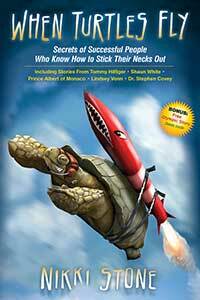 When Turtles Fly spells out the winning philosophy of the Turtle Effect. First get in touch with your passion, your “soft inside.” Develop a hard shell, then stick your neck out...and go for gold! Now an acclaimed motivational speaker and peak performance coach, author Nikki Stone helps people in all walks of life to overcome fears, failures and plateaus and realize their full potential. In this step-by-step guide to success, she and her team of high achievers share their stories about reaching for dreams...and grasping them. Learn their secrets, then dream big and fly...!